No matter how young you may feel on the inside, drooping eyelids and eye bags can put years on you. 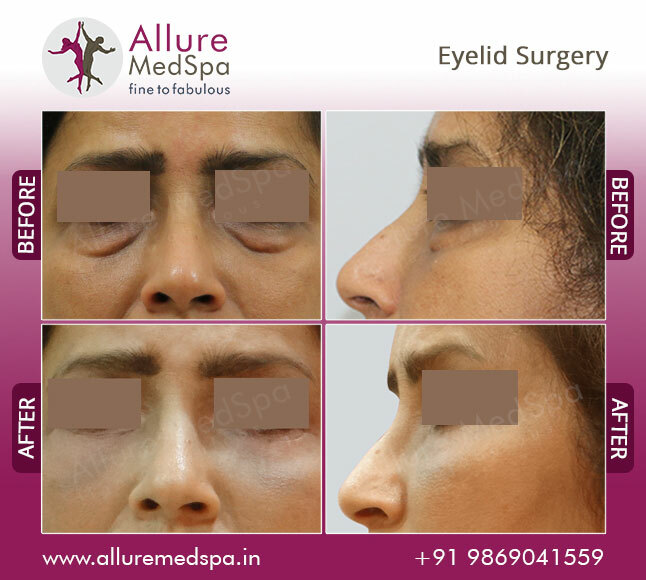 However, opting to undergo eye bag removal surgery with Allure Medspa could help you regain that facial glow you miss. We can restore the brighter, more alert look of your younger years with cosmetic eye bag removal surgery to get rid of those ageing eye bags. If your answer is ‘yes’ to any one or more of these signs, then eyelid surgery could very well be the answer you’re searching for. Although this procedure is done for pure cosmetic reasons, in extreme cases, area of visibility is noted to have been improved. Before you decide to go ahead with eye bay removal surgery, we will offer you a thorough one-on-one medical consultation with our veteran cosmetic surgeon, Dr. Milan Doshi. During the consultation, you will be asked about the results you would like to achieve. This will help your surgeon to understand your expectations and determine whether they can realistically be achieved. In evaluating your suitability for eye bag removal surgery, your Cosmetic surgeon will assess the amount of excess fat and skin in the eyelid areas, the position of your eyebrows, and the condition of the muscles around your eyelids. In the pre-op stage, your medical background will be checked to customize the surgical process to suit you and eliminate all kinds of possible risks. 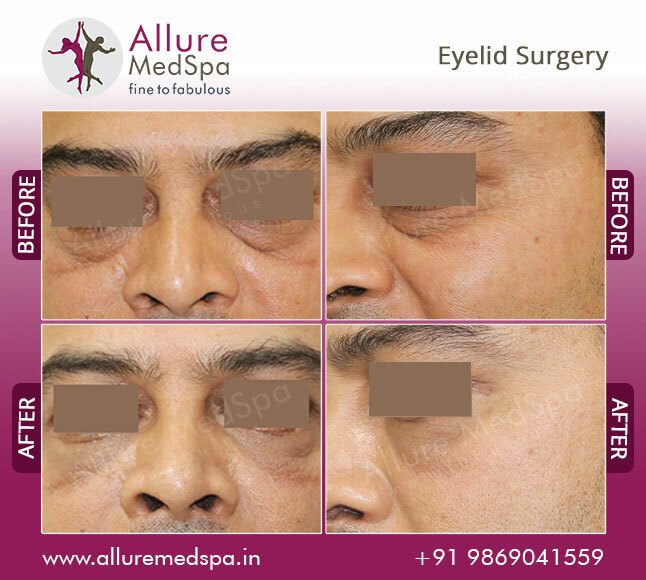 Eyelid surgery is performed using local anesthetic with sedation or a general anesthetic. You may be able to go home on the day of your surgery, although most patients are asked to spend one night in hospital. 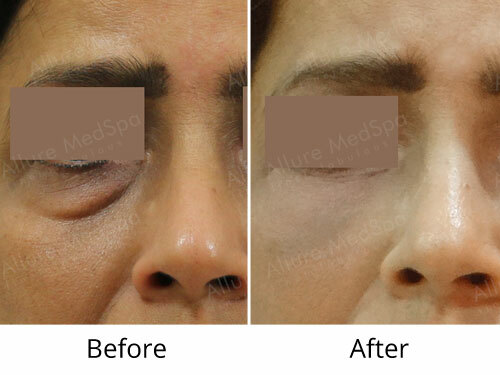 For upper eye bag removal surgery, an incision is generally made in the natural fold of the upper eyelids and extends slightly beyond the outside corner into the existing creases. Excess skin, fat and muscle can then be removed. Because the incision follows the natural contour of the upper eyelids, it will be well camouflaged when healed. For lower eye bag removal surgery, an incision is generally made just below the lower lashes. The same procedure then follows for the lower eye bags. Sometimes even laser may be used to tighten the skin providing good elasticity as well. The recovery period varies from a few days to a few weeks depending on your age, bodily healing ability and extent of the surgery. Allure Medspa prides in giving a thorough and grade one aftercare encompassing medication, follow-ups, clear instructions and prompt attending to your concerns. If you’re considering eyelid surgery, simply walk in today! 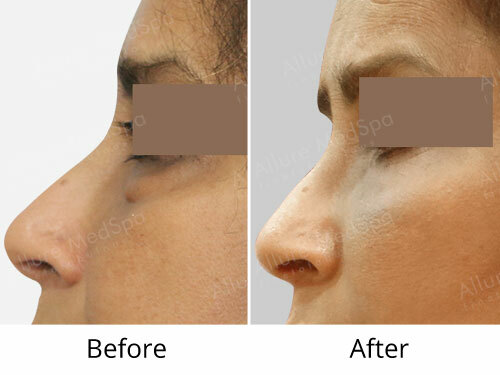 Allure MedSpa which is renowned for its state-of-the-art internationally acclaimed services, offers value for the money spent for cosmetic procedures. To know more about the cost of your procedure request a consult by filling the form below. Your consultation is your chance to ask questions about Eyelid Surgery and put your mind at rest. Your surgeon will be able to offer you full explanations and answers to all of your queries. After eye bag surgery you should be able to resume most of your normal activities within ten days. Although you may feel well enough to return to work just a few days after surgery, your vision may still be slightly blurred which could make reading or driving more difficult.